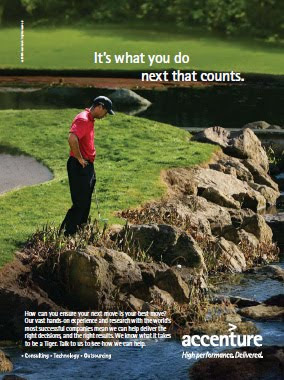 I was recently quoted in an Jay Flemma's A Walk in the Park golf blog. Fan and blogger Jim Colton wrote on one well-trafficked Bulletin Board, "He portrayed and sold an image of devoted father and family man. Remember those sappy family pics with his kids and the dogs jumping all over them, everybody smiling wide as can be? I was happy to believe it because I wanted to believe it. Like I wanted to believe in Michael Jordan. So I’m disappointed that he was exposed as a fraud. 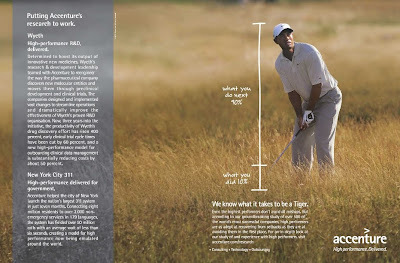 So best of luck getting your 19+ majors, Tiger. I wish you well. I don’t think I will root for him like I once did. In the end, I think he’ll have his 19+ majors, a bunch of money, a girlfriend half his age and not much else, similar to how his buddy MJ has six rings and is now a punchline. I wouldn’t trade places with either of them. 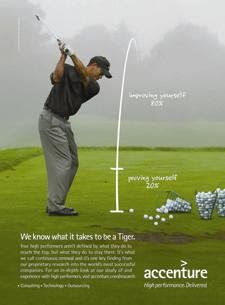 'Be Like Mike', 'I am Tiger Woods'. No thanks." And to think, I was extremely concerned for Tiger's safety on Friday when the news broke that he was in an accident and was in serious condition. 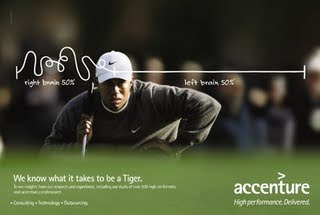 This definitely puts a different spin on Accenture's long-running 'Be a Tiger' campaign. A lot of the ads are high on the unintentional comedy scale, the jokes and potential parody ads kind of write themselves.